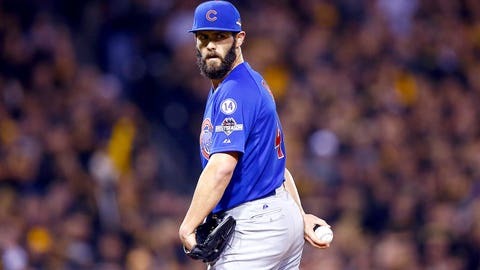 When looking at Jake Arrieta’s final line — 9 innings, 4 hits, 0 runs, 0 walks, 11 strikeouts — in the Cubs’ 4-0 NL Wild Card Game victory it’s actually hard to believe, but as dominating as the Cubs ace was on Wednesday night, the host Pirates had a chance to beat him. Arrieta was amazing, but he wasn’t quite perfect. In the sixth inning, the Pirates put together a legitimate rally. The bottom of the inning started with pinch-hitter Travis Snider driving a hard grounder up the middle for a leadoff single. Gregory Polanco smoked a line drive right at third baseman Kris Bryant, but Bryant’s circus-act catch meant that it simply turned into out number one. Arrieta then gave the Pirates a gift by hitting Josh Harrison with a curveball, putting a runner in scoring position for the first time all night. Andrew McCutchen hit a laser to shortstop that Addison Russell couldn’t handle, allowing everyone to advance, loading the bases and bringing the tying run to the plate. Down 4-0, having only had two baserunners prior to the inning, a Pirates team that looked unable to put anything together against Arrieta suddenly was one swing away from tying up the game. Starling Marte, the team’s cleanup hitter, stepped to the plate. While not a traditional slugger, Marte hit 19 home runs this year and is capable of driving the ball, especially if he can sit on a fastball. Marte is somewhat of the cliche of a raw baseball player; he crushes fastballs and struggles with soft stuff that moves. For his career, he’s hit .313 with a .521 slugging percentage against four-seam fastballs, and .294 with a .423 slugging percentage against two-seam fastballs. For comparison, he’s hit .198 against curves and .260 against breaking balls, with less power than he produces on fastballs. Marte is, essentially, a fastball hitter. So unsurprisingly, Arrieta started him with a slider, but he missed his spot and bounced the ball in the dirt, allowing Marte to easily take ball one. With the bases loaded, Arrieta decided to challenge Marte, and gave him the fastball he was certainly looking for. And Marte crushed it. Arrieta’s 96 mph fastball left Marte’s bat at 109 mph, according to MLB’s Statcast tracking system. Marte had previously hit the ball 109 mph (or harder) on 13 occasions this year, resulting in three singles, two doubles, and two home runs, plus six tough-luck outs. The 14th ball that he hit that hard turned out to be one of the latter. TV broadcaster Ernie Johnson described it as being "well hit to short," an entirely apt call. Marte blistered the ball, but it went right to Russell, who was fielded this one cleanly and turned it into an inning-ending 6-4-3 double play. A few seconds after Marte hit a ball as hard as he could, the Pirates rally was over. Every ball the Pirates hit in the sixth was scorched, and Arrieta gave them a free baserunner in between giving up four rockets. Balls hit 100-plus mph are usually base hits, and often extra-base hits; one of the keys to Arrieta’s success this year was not giving up this kind of hard contact, especially not in bunches. But because the Pirates weren’t able to get under any of their line drives — in part due to Arrieta’s ability to locate at the bottom of the strike zone — and because Marte’s blistering shot went right to the Cubs shortstop, the Pirates ended up without a run in the only inning where Arrieta wasn’t unhittable. And that was that. They never seriously threatened again, and Arrieta would go back into cruise-control mode, with the Pirates only putting two more guys on base the rest of the game, neither one advancing past first base. For one inning, though, Arrieta was hittable, and the Pirates hit him hard. But line drives right at infielders don’t score runs, and the Pirates inability to get the ball in the air allowed Arrieta to pitch around his rare moment of vulnerability. The Pirates had one shot, and unfortunately for them, their lasers found gloves.